When you trace one of our Celtic Interlace designs through its interwoven pattern, you find that it's design is endless. For this reason it has become a favorite of lovers or friends to represent their eternal commitment. The Celtic Interlace pattern, through its many twists and turns has also come to represent the endless riddle of life and the quest for its meaning. We all have the same beginning and end. Each ring we make is individually handcrafted to your exact size so that the pattern remains continuous. Our rings are solidly made to last a lifetime! We can craft gold rings in either yellow or white gold. You may choose an antiqued or polished finish. The rings shown are the antique finish. All of our rings are made by hand in our small Craft Studio We have total control of the full manufacturing process so can give the highest assurance of both quality and craftsmanship. 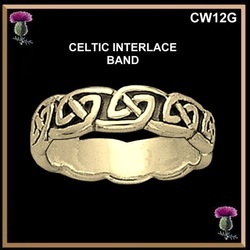 All of our Celtic Interlace ring have a lifetime warranty.Because we actually make these rings you deal directly with the Scottish craftsman and you get a better prices because there are no middlemen. Our prices very competitive. We have a wide variety of designs and can also set stones of any suitable size in any of our rings; diamond, ruby emerald and sapphire are a few of the choices available however we can set any type of stone. Delivery is 2 to 6 weeks. This Celtic Interlace ring is (1/4") 6mm wide and is available in all materials; silver, 10K & 14K yellow and white gold. Above a size 12 there is a gold surcharge.